Warning, the story of Bobbles is a long read. It was not written for the internet; instead the story is my attempt to remember the rewarding experience of raising a handicapped animal. It may sound odd, however my eyes water writing this introduction of Bobbles-not because of his passing-everything, everyone will pass on. But my eyes water celebrating his life, affection and of course his dancing. If you do not have the time to read about Bobbles-that’s okay. We live in rushed times. If however you have around ten minutes to read the story of Bobbles, you will find many of the suggestions offered on this web site (and some not yet written) incorporated into an educational and heartwarming story. 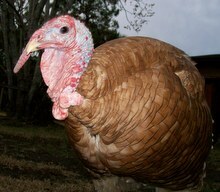 The story of “Bobbles” begins with a mixed breed heritage turkey nesting under a pine tree in early spring. Around the 27th day of the hen setting; 14 eggs hatched out and it was readily apparent the new poults were a colorful mixture of Bourbon Red and Royal Palm turkeys. The breed and coloring of the birds was not surprising as our Bourbon Red male had recently succeeded in a bloody contest with our Eastern Wild Male to take over the Alpha status of our flock and so we were expecting to have “a lot” of baby Red birds that season. We gathered up the mother hen and her new poults moving them to a spacious indoor pen for safe keeping from predators and rain. Under the pine tree four eggs remained un-hatched in the nest. However placing the eggs to our ears we could hear the tap-tap of live poults in three eggs while the fourth egg proved to be liquid, and was quickly buried. The three live eggs were placed in a pre-warmed incubator and by the next morning all three eggs were peeped (The correct term would be “Pipped”, but we’re hooked on the term “peeped’). One egg hatched out around sundown and we slipped this poult under its mother in the pen. That evening the second egg hatched out and the initial inspection of the poult was not very heartening. The newly hatched bird with Bourbon Red coloring had some type of neurological disorder that caused it to tremble uncontrollably, its little head shaking wildly. Furthermore, the poult was unable to walk and could only just barely lift its vacillating head. Further inspection showed that the head was oddly misshapen, slightly smaller and elongated than normal with bulging eyes. During the hatching season; around one out of fifty new birds emerge from the eggs with some type of medical issues. Some of the medical issues; for example herniated umbilical cords would heal with care. However one condition had proven to be 100% lethal. We had rather callously coined poults with this particular condition “Spinners” (Spraddle-leg deformity is the correct name) because they could not walk, only lay on a surface and spin in circles. These unfortunate poults have a normal appetite and will drink when held upright, and in fact seem nearly normal if held upright. Nevertheless, try as we may, we had never had a poult with the “Spinner condition” survive more than two weeks. Due to their problems, “Spinners” cannot be placed with their mother because they cannot eat or drink or sit up without assistance, are not mobile (they spin) and consequently cannot go the warmth of their mother if she happens to shift even a couple of inches. We both agreed the newly hatched poult was one of the Spinners, even though uncontrollable shaking was not a normal symptom of these unfortunate birds. 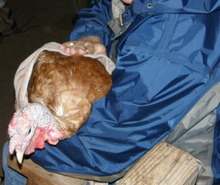 The shaking baby turkey was placed in our heated brooder with a stuffed animal and a mirror for company. It was my belief at the time that the bird would never leave alive the brooder alive. However we did what we could to make it comfortable and shortly thereafter, the last egg in the incubator hatched out a healthy poult and rather than slipping the new poult under the mother, we placed the new bird in the brooder with the shaking bird for companionship. 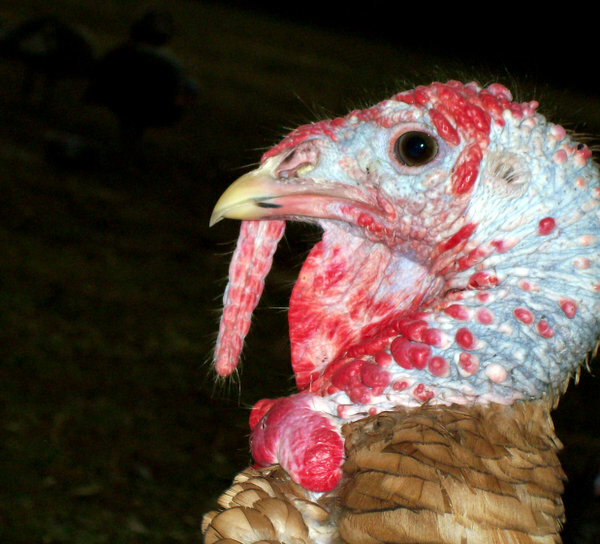 Above all else, turkeys are social creatures. Around this time, we christened the tiny bird with the uncontrollable shakes: “Bobbles” after the terrible trembles that afflicted the helpless little yellow and red bird. The shakes were so bad; we had to hold Bobbles over the food bowl so he could peck at the Game Bird Starter or the little water bowl to drink. Despite Bobbles affliction, in a few days he surprised us by soon learning an unsteady walk; the walk being more of a hop and falling stumble, however using his legs and by walking about- he was effectively eliminated from the “Spinner” classification. We were dealing with an unfamiliar medical condition entirely new to our experience, but perhaps Bobbles was not doomed to an early passing as where the other spinner babies. A couple of days went by, other hens hatched their poults and more eggs were added to the incubator. As soon as I had a replacement, I moved Bobbles 'brooder companion' to its real mother and added a newer companion. 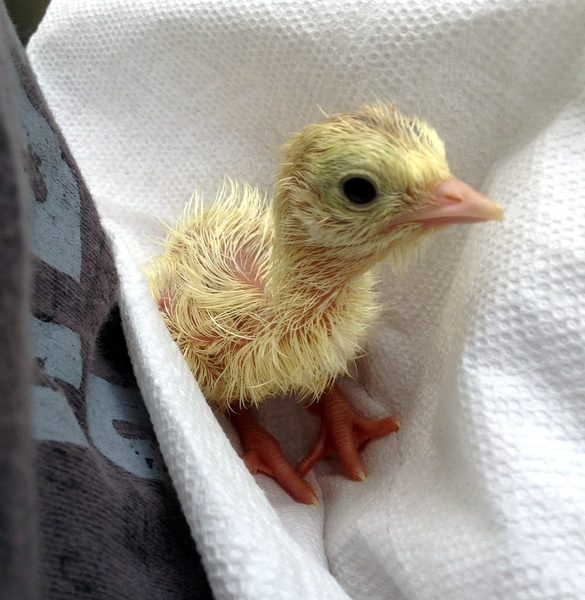 Also an actual “Spinner” was hatched in the incubator and it was also added to the brooder with Bobbles and the new poult. 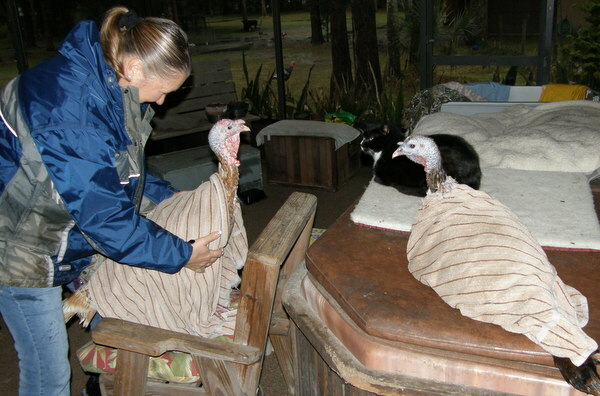 That made three little turkeys rubbing against the stuffed animal that was their temporary mother. Within the week, the spinner baby passed away and Bobbles although unsteady on his feet, began to have visibly less “Head bobbing” as his muscles developed to compensate for the trembling. He was able to eat and drink without any assistance. After a few weeks another hen hatched out her poults and we again moved mother and her brood to an inside pen. By this time we made the appraisal that Bobbles would survive and made the somewhat difficult decision to slip him under his new mother. Despite the fact that Bobbles was nearly twice the size of the new poults, the hen took in Bobbles with the same care and nurturing that she gave to the rest of her new flock. Perhaps another three weeks passed, by this time we had moved Bobbles, his adoptive mother, brothers and sisters to an outside pen. Bobbles shaking had settled to fine tremors that would never leave him, although in time the tremors came to be barely noticeable. He grew to be a handsome red and white bird, taller than the others and with a head that was still slightly misshapen. Baby turkeys test their wings and begin short test flights after only a few days old. As Bobbles brood mates improved their flying ability, the mother hen nightly moved the entire brood up to the elevated nest constructed in each of our outside pens. This is where we learned of Bobbles other handicap. Despite functioning wings, he seemed to have no concept of flying. 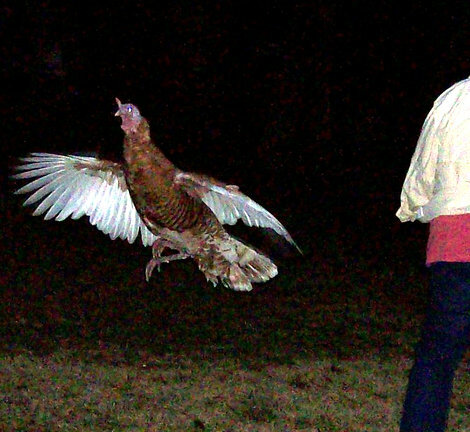 At twilight Bobbles would run around in an absolute panic at not being able to reach the hen for the night. Consequently each evening, I would have to pick up Bobbles and place him in the elevated nest, where he would snuggle with the hen and brood mates. Catching him was relatively simple, because unlike other turkey poults; even panicked he could barely produce a functional run. At daylight, he was able to fall off the nest box, spreading his wings to a crude landing and not hurt himself. This process went on for nearly a month until we were faced with a new “Bobbles problem”. 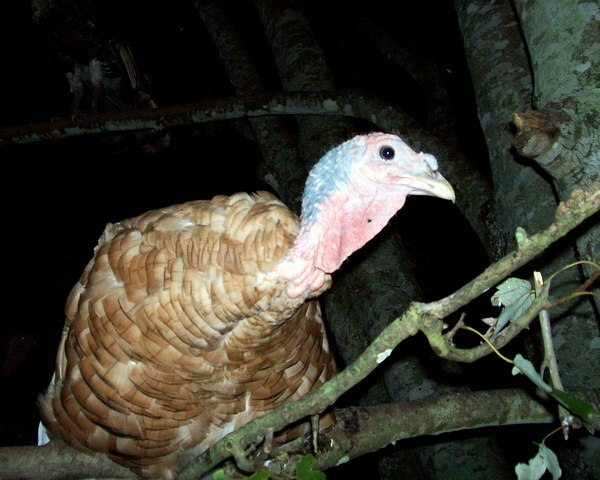 Once our turkeys reach a certain size, the mother hen and poults are released from the outside pens to the roost at night in a large maple tree with the adult turkeys. It had been apparent for a while that Bobbles would most likely never reach 'tree stage'. Bobbles would have to be kept penned, and that meant trying to match him to a new mother. 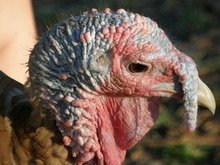 Turkey hens are excellent mothers, but have a reputation not to take in “strange” poults, that are not theirs. We had learned to reduce a large amount of this ‘bad reputation’; by switching eggs around during the laying stage. (Before the hens began setting). 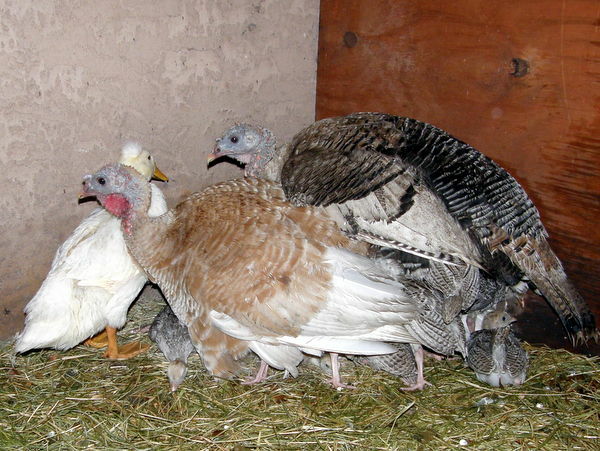 The positive results had been that most of the turkey hens always had multiple colored batches of poults. 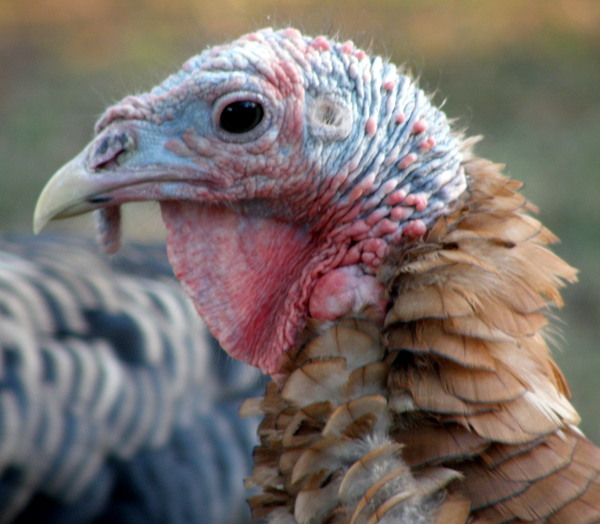 For example a turkey hen with red feathers and was expected to have all red poults, might after the egg mixing hatch poults in varying degrees of red, brown, white, black or any of those color combinations. 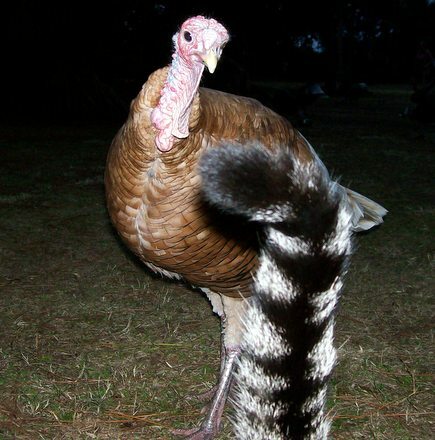 Consequently, if there was some requirement to “adopt out” a poult to another hen, the potential problems were greatly reduced due to confusion in the color scheme. This confusion also reduced potential problems when we sometimes times placed more than one mother and brood in the same pen. The two turkey hens would only have a vague idea, of whose was whose. So it was that Bobbles mother, brothers and sisters were set loose to happily roost on a branch in the maple tree and Bobbles was moved to a secure pen with the hen that had poults the next closest in size to Bobbles. As luck would have it, this new mother had quite a few birds that matched Bobbles coloring and she also had a white duck. More about the duck later. Moving Bobbles to the new mother was not an immediate success as Bobbles stood out, being quite a bit larger than the other turkey poults. Although the duck was Bobbles size and growing fast. In the beginning, Bobbles “new” mother was protective of her brood, including her duck and would chase Bobbles away. But no serious harm was being done to him, as he looked just like her other red poults -Bobbles was just larger. When the sun set the first day, the hen, who at that time was still nesting on the ground, allowed Bobbles to slip into the cuddling group, even letting him slide into the coveted prime spot under one of her wings. The next day at first light she again chased him away, only to let him into her folds at sundown. By the third day, he was fully accepted. Spring at last changed into summer and during the season change, Bobbles new mother moved her brood to the elevated nest. Once again Bobbles franticly raced around the bottom of the nest box, unable to comprehend the use of his wings or even attempt small flighty jumps that all the young turkeys attempted when playing. Luckily Bobbles soon realized that he had another flightless companion in a white duck. Neither could reach their mother in the elevated nest and so both of them would cuddle together at night, comforted by each other’s closeness. At daylight, the hen and her brood would be turned loose to graze for the day and it was quite a comical site to see her herding the waddling duck and the tall gangly Bobbles. The neighbors had two white Peking Ducks that would cross under the fence to swim in our water buckets and during the spring, the female duck and one of the turkeys began laying eggs in the same nest under a pine tree. Many of the eggs, both turkeys and duck were lost to a raccoon raid, before the turkey hen finally set upon the nest. Only one duck egg survived the raid and the duckling hatched out with the turkeys approximately 28 days later. The hen accepted her webbed foot duckling as if there was nothing different from her other poults. It was not long however, before the duckling far outpaced its siblings in growth, tripling in size, but with little stubby wings that would never lift the large duck. While the summer passed, the duck out grew its mother, but showed no interest in the neighboring ducks as it considered itself a turkey. Bobbles also grew at a surprising rate. The bird that we had always considered a girl had developed amazingly long legs, a long neck and hardly any bulk to his frame. In fact Bobbles resembled a Heron or Egret more than a turkey. 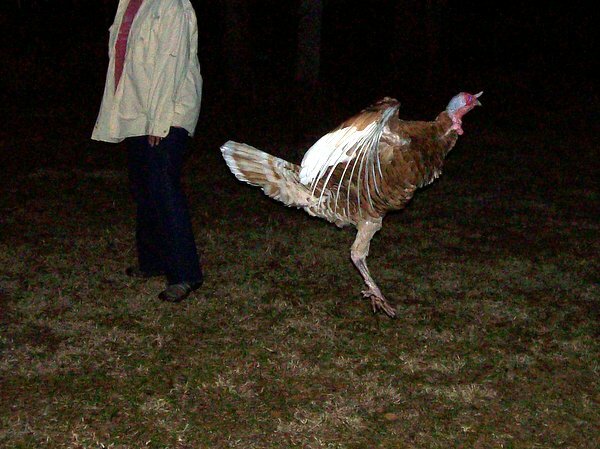 Although he still had not developed typical male turkey features, he had far outgrown the normal height for a turkey hen. We would ask each other “Boy or Girl?” Until finally one day Bobbles gave his first squeaky gobble which caused my wife and I to laugh hysterically. “Boy” It was settled. Towards the end of summer, Bobbles had passed a major milestone. He had taught himself to “hop” onto the 2 foot high perch inside his pen. And so no longer slept on the ground with the duck, but spent the night on his perch like the other turkeys. Consequently as Autumn approached, with much sadness, we found a new home for the duck, a home with a proper pond and other ducks. Bobbles now spent his days with our flock of twenty turkeys, grazing, dust bathing and running to us for snacks when we brought out bananas or bread. His nights were spent locked in his pen where he could see the other birds in the roost tree. Bobbles grew tall and handsome (as turkeys go), colored a pale shade of red, with huge snow white wings of his father’s heritage. Intertwined in his pale red feathers were faint, black tiger stripe markings that were the only indicative signs of his white and black Royal Palm mother. Bobbles, who had improbably managed to survive his “shaky” first two weeks, could almost certainly be termed a miracle. Without doubt we had used a lot of effort to save and comfort a bird that was obviously (to me anyway) not going to survive. A bird that we had quickly determined had major health issues and in all likelihood, brain damage. (I would explain to people that he had been oxygen deprived while attempting to escape his egg.) The explanation was a good as any. Never the less, against the odds, he survived and even thrived. During those first two weeks Bobbles had imprinted on us as his parents. 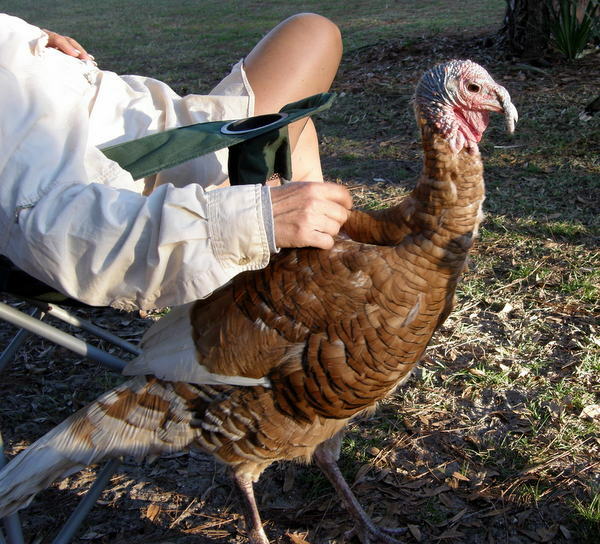 Consequently as he grew into adult hood, he considered himself a human and not a turkey and was our constant companion whenever we worked outside. The “Bobble Gobble” always brought laughter. In point of fact, the brain damaged bird brought a great deal of joy into our world. 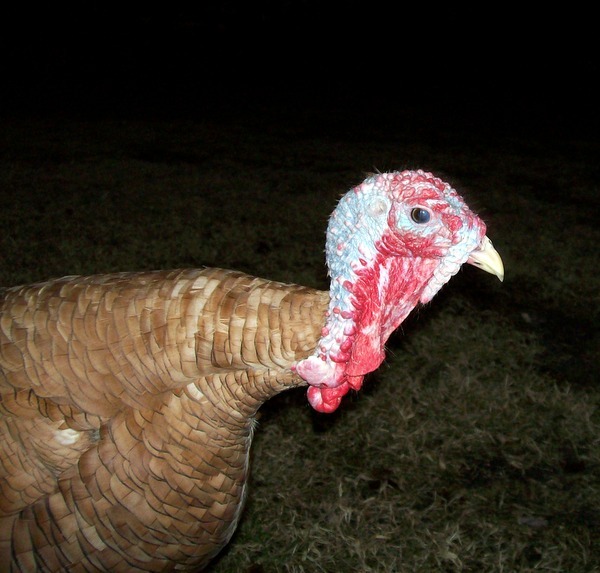 At odd intervals, we would reach down and pick up his skinny body and pet him or rub his bumpy head in the fashion that turkeys enjoy. He would respond with odd squeaky noises and close his eyes, enjoying the attention, sometimes falling asleep in our arms. I don’t believe I have ever known a trusting soul as Bobbles. At various dinners or reunions, the subject of Bobbles would come up, everyone enjoying the story of “Bobbles and the Duck”, the “Bobble Gobble” or other stories like when our hateful little Bantam Cochin rooster would kick Bobbles making him jump straight into the air or bobbles attempts to fly into the maple tree. Eventually everyone came to enjoy hearing how Bobbles loved to dance. Every evening, as the sun dipped below the tree line, the turkeys, following some ancient programming would one by one, make their way into the Maple tree to roost for the night. Bobbles, despite his handicaps was not immune to these time forgotten commands and would make various attempts to get up to the maple tree roost. The attempts were simultaneously comical and very sad. His huge white wings had an enormous wing span of at least four feet, which could easily lift his light body. However try as he might, landing on, or even touching the over head branch was nearly impossible for him. Usually he would jump, flapping his wings and overshoot the branch by a foot or more. Occasionally by sheer accident he would somehow grasp the branch and hold on. Our Maple tree roost has been constructed in a series of steps, so the birds can hop from step to step on their way their preferred branch. 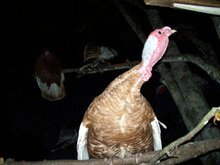 The hens and young birds can make it into the tree from a standing position on the ground, but the males, who are 10-15 pounds heavier, have to “hop” their way up. With some effort Bobbles was able to reach the first step, which was only a few inches higher than his regular night perch in the pen. So beginning in early fall we allowed him numerous practice attempts to reach the second step, a thin maple branch only three feet away from the first step. Many times while he concentrated jumping to the branch, he would turn his head upside down and lay it over on his back! We would shake our heads at the behavior, assuming that thinking too hard made his head turn upside down, perhaps even having a seizure. Until it was too dark to see the branch, he would make his awkward jumps, nearly always missing the limb and finally we would scoop him up and put him in his night pen. But he never quit trying and surprisingly after a hundred or so attempts at the branch, Bobbles was able to consistently hit the branch and scramble to hold on. The landings were never graceful, but they became somewhat consistent until we finally allowed Bobbles to leave his pen and join the other birds on the roost at night. A major milestone had been passed! When thinking about writing this story of Bobbles, I asked my wife “What was your best memory of Bobbles?” She thought for a minute and replied: “Besides him sleeping on my lap, the first time he made it to the branch is my favorite memory”. I considered my own question and thought, my favorite memories of Bobbles was his dancing. Autumn brought the first cold rain storms and we found Bobbles standing miserably on the ground shaking violently, his thin frame was unable to keep him warm. We picked up the freezing bird and took him inside to dry him. 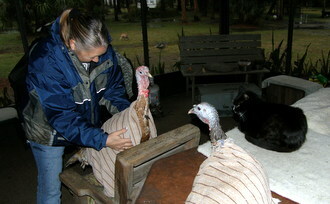 We have a memorable picture of Bobbles and another one of our turkeys “Butterball” wrapped in towels, sitting next to our cats, waiting out the rain. After that first cold rain, we always kept an eye for cold fronts or rain and would place Bobbles in the indoor pen with a heat lamp if the weather was predicted to be unfavorable. The autumn change to cooler temperatures always causes profound changes to our turkey flock: There is a marked increase in the level of activity, increased excitement and consequently greater noise levels. The cool weather increases fighting between both sexes, as the birds endeavor to improve their flock status prior to the spring breeding season. However the chilly conditions also initiate entertaining games of tag, friendly chases around trees with their wings held low and even dancing. Turkey dancing similar to the dancing of whooping cranes consists of a combination of hops, and sprints, obviously enjoyable, as birds squawk their delight and flap their wings as they dart about. With the arrival of cooler temperatures Bobbles now around 9 months old, and despite the fact could barely run let alone fly, willingly participated in the turkey dancing. In fact we soon realized that Bobbles was fairly “Addicted” to dancing! 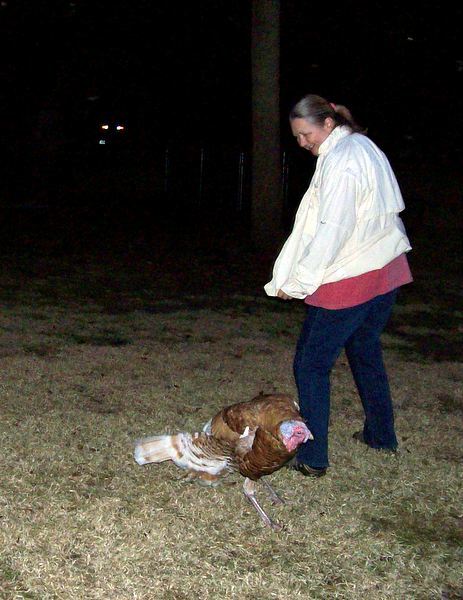 In the years prior to Bobbles, we had easily enticed many of the turkeys to share their dancing with us. In fact we had our own name for Turkey Dancing: “Wingz” (pronounced ‘Weengzzz!’ The name coming from their wings held out vertically when dancing. And so it was with Bobbles, he was easily coaxed into turkey dancing with my wife and I. Of course Bobbles had his own version of “Wingz”, intermittingly sprinting, randomly jumping, his four foot wide wings spread and performing rather bizarre un turkey like shimmies, shakes and head twisting. Every evening from early autumn until late spring we would dance with Bobbles, laughing at his jumps, his posture and antics. 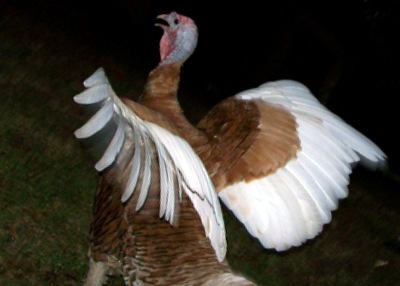 Usually just before the turkeys would fly onto the roost, the winter evening stars just appearing in the sky, was Bobbles favorite time to Dance, although he was easily coaxed into dancing most anytime. Just calling out the term ‘Weengzzz!’ would make Bobbles head arch up and he would strike his “Wingz” pose. 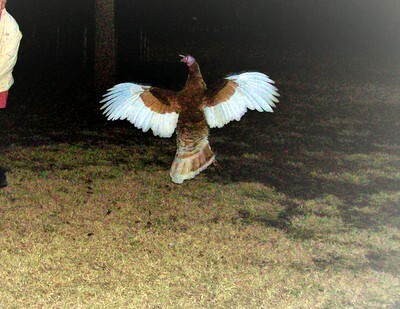 We would then yell out “Dance Bird Dance!” And off he would go, running with his wings outs. Of course, often we would have to join in and chase after him. Other times, we would be working in the yard, for example, wrapping our citrus trees against an upcoming cold snap and Bobbles would initiate the dance. When Bobbles wanted to dance, he would approach us, strike a pose, posture very erect, head held at a slight angle, wings slightly loose. The turkey’s normal stance is, more relaxed, curious about everything and always looking for food, so Bobble’s nonverbal request to dance was easily identified. How could we deny his simple request? We would stop our work, one of us would mirror his posture, arms slightly extended vertical. We would hold the stance for a moment, then dart away, turn, do a feint at Bobbles, and dart away again. Bobbles would begin his peculiar jumping, hopping, twisting in circles with head a ground level and then repeat the twist with his head up. First we would dart away one direction, then he would dart follow, jumping, beautiful white wings at full spread. Sadly Bobbles the miracle bird who loved to dance, passed away during the night. The phenomenon truly was that he had lived to be almost 14 months old. Such a brief time and yet he who was handicapped had brought so much joy to the world while he lived. There was no shortage of tears at his abrupt passing. My wife’s testimonial when reminiscing about Bobbles was “My heart broke when Bobbles died”. How could I know you’d ever say goodbye?